welcome you to Ortho Mossaz practice. the Ortho Mossaz dental practice is dedicated exclusively to Orthodontics. the prevention and the correction of dental and dento-facial deformities. but don’t hesitate to contact our front desk using the form on the contact page or directly by phone or email. In case of an orthodontic emergency our helpful team is there for you. Dr Jessica Mossaz-Marinic. 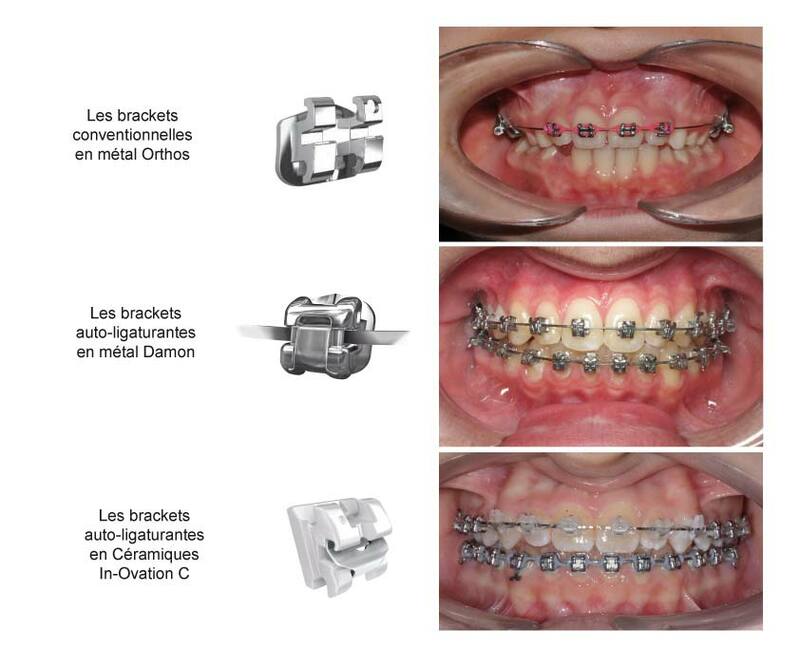 All three are SSO Swiss Specialists in Orthodontics according to the Swiss Society of Dento-Facial Orthopaedics requirements.During your initial consultation you will be seen by one of the three orthodontists according to your choice and you will keep this person as your orthodontist. During the course of your treatment, it may happen that for specific reasons, like emergencies or a tight schedule, you see one of the other two orthodontists. Born in Geneva, Dr Claude Mossaz received his Dental degree as well as his Doctorat at the University of Geneva. He was trained in Orthodontics at the University of Washington in Seattle where he obtained a Master of Science in Dentistry as well as his Certificate in Orthodontics. He is a certified SSO specialist in Orthodontics and was Assistant Professor at the University of Geneva for more than 20 years. He is a member of the EOS, AAO, and an active member of the Angle Society of Orthodontics (ASE) since 2005. He speaks French and English. Swedish and born in South Africa, Dr Katarina Mossaz-Joëlson received her Dental degree as well as her Doctorat at the University of Geneva. She graduated from the Orthodontic program in Geneva and is a certified SSO specialist in Orthodontics. She is a member of the EOS. She speaks French, English and Swedish. Born in Geneva, Dr Jessica Mossaz-Marinic received her Dental degree from the University of Geneva in 2009. She then underwent a 4-year postgraduate education in Orthodontics at the University of Bern where she also obtained her Doctorat. She received her SSO Specialist in Orthodontics degree in 2016. In addition to her activity in the office, she has worked as a supervisor in the Orthodontic Department of the University of Geneva. She is a member of the EOS and of the AAO. She speaks French, English and German. Born in Paris, living in Annecy, France, Anastasia joined our office in May 2016 as our Office Manager. She is in charge of the reception and the financial aspect of our treatments and speaks fluently French and English. Dental hygienist, Brigitte is originally from Fribourg. She graduated from the Geneva Dental School in 1982. She has been part of our team since. Dental hygienist, Johanne comes from Quebec. She received her diploma in 1997 and has been working with us since September 2006. She speaks French and English. as a Dental Assistant in our practice since January 2004. She received her diploma in Lyon (France) in 2000. Born in Geneva, Allison has been working in our office as a Dental Assistant since September 2013. She received her degree from the School of Dental Assistant of Geneva in 2013. Born in Paris, Delphine has join our office beginning of 2018. She received her diploma in Paris (France) in 1998 and passed her swiss equivalency exams in 2015. Our office is equipped with a recent digital radiology device that includes the panoramic radiography and the lateral headfilm. It allows a reliable diagnostic with a reduced exposition to radiation. During the initial records appointment, digital dental models are made with an intra-oral scanner. It is therefore not necessary to take dental impressions. This technique allows us to manipulate the models on screen and to measure and analyse the teeth in 3 dimensions. With this method it is also possible to send the scans directly to the INVISALIGN Lab for the production of aligners and to the INCOGNITO Lab for the manufacture of lingual braces. Supernumerary teeth in the maxilla and mandible-an interdisciplinary challenge. Part 2: diagnostic pathways and current therapeutic concepts Mossaz J, Suter VG, Katsaros C, Bornstein MM.Swiss Dent J. 2016;126(3):237-59. Supernumerary teeth in the maxilla and mandible-an interdisciplinary challenge. Part 1: epidemiology, etiology, classification and associated complications. Mossaz J, Suter VG, Katsaros C, Bornstein MM.Swiss Dent J. 2016;126(2):131-49. Morphologic characteristics, location, and associated complications of maxillary and mandibular supernumerary teeth as evaluated using cone beam computed tomography. Mossaz J, Kloukos D, Pandis N, Suter VG, Katsaros C, Bornstein MM.Eur J Orthod. 2014 Dec;36(6):708-18. Professionals' and laypersons' appreciation of various options for Class III surgical correction. Mossaz J, Kloukos D, Pandis N, Suter VG, Katsaros C, Bornstein MM. Eur J Orthod. 2014 Dec;36(6):708-18. Orthodontists' and laypersons' aesthetic assessment of Class III subjects referred for orthognathic surgery. Fabré M, Mossaz C, Christou P, Kiliaridis S.Eur J Orthod. 2010 Aug;32(4):395-402. Cervical headgear vs pendulum appliance for the treatment of moderate skeletal Class II malocclusion. Fabré M, Mossaz C, Christou P, Kiliaridis S.Eur J Orthod. 2009 Aug;31(4):443-8. Skeletal and dental changes following surgically assisted rapid palatal expansion. Orthodontic-surgical cooperation in the treatment of maxillomandibular deformities. Mossaz CF, Byloff FK, Kiliaridis S.Am J Orthod Dentofacial Orthop. 2007 Nov;132(5):616-23. Case report: surgical-orthodontic management of posttraumatic obstructive sleep apnea syndrome. Facial asymmetry and obstructive sleep apnea syndrome. Correction of mandibular dentoalveolar retrusion by segmental mandibular surgery. Unilateral and bilateral corticotomies for correction of maxillary transverse discrepancies. Slow maxillary expansion: a comparison between banded and bonded appliances. Redevelopment of the calvaria after partial craniectomy in growing rabbits: the effect of altering dural continuity. At what age should you consult an orthodontist? There is no answer to this question because each orthodontic problem determines its own best starting time. Some malocclusions are best treated at a young age when for others it is best to wait until the permanent dentition. We recommend you to ask your family dentist for advice and when in doubt come to the practice for an initial consultation. We can then make a primary diagnosis and tell you at what age it is best for your child to be treated. An early examination allows the orthodontic specialist to determine when a child’s particular problem should be treated for maximum improvement with the least time expense. In many patients, early treatment achieves results that are unattainable once the jaws have finished growing. Furthermore, early intervention can make the completion of treatment at a later age easier and less time consuming. Orthodontic treatment can be successful at any age. In fact, about 25% of orthodontic patients today are adults. The biological process involved in tooth movement is the same in adults and children. The health of an individual’s teeth, gums and supporting bone is what is most important in determining the prospects for improving an adult’s smile and dental health. However, because an adult’s facial bones are no longer growing, some corrections cannot be accomplished with braces alone. In these cases orthognatic surgery might be necessary to position the jaws in a correct position and achieve functional and aesthetic results. At this appointment we will perform an intra-oral and extra-oral examination. We will look for occlusal disturbances, aesthetic problems, functional and aetiological responsible factors. We will then give you information regarding the diagnosis, the ideal age for treatment, the different options of treatment and an approximate estimation of the cost. Do not hesitate to ask us all your questions at this moment. When it is time to start an orthodontic treatment, an appointment is fixed to take all the initial records. It includes most of the time radiographic images, intra- and extra-oral photos and a scan of the dentition. These records, together with the initial exam, are carefully analysed by the orthodontist to prepare the proper treatment plan. The next appointment, the consultation, is very important, this is when all the records are shown and explained to the patient and parents. The treatment plan and its cost estimate are then discussed. If accepted, appointments are fixed for the start of the active treatment. Our office uses the official SSO tarification for more information see the related links. The bills are sent by the Caisse des Médecins. It is possible to arrange with them a staggering of the payment of your bills. This appliance is worn 10-14 hrs/day to enhance mandibular forward growth using the maxilla as an anchorage. The opposite effect is obtained with this appliance, which is worn 10-14 hrs/day. It enhances maxillary forward growth using the forehead and the chin as anchorage. Patient 7 years of age treated with a reverse pull headgear. This fixed appliance is often used to widen the maxilla in order to correct a crossbite and to gain space for the permanent teeth. Patient 9 years of age treated with a palatal expander. The "Distal Jet" appliance is used in some cases to replace the classical headgear. It distalizes les upper molars using the palate and the premolars as anchorage. It is used as a first phase of the treatment to correct a dental Class II. The duration of this "non-compliance" is about 6 months. It is always followed by a second phase of treatment with conventional fixed appliance therapy. 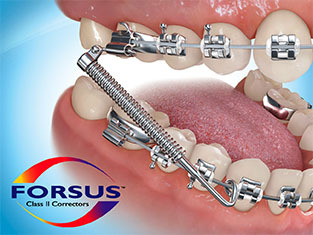 Forsus Class II corrector is used to replace traditional Class II elastics. It is fixed intra-orally and can be adjusted or removed only by the orthodontist. It is a "non-compliance" type of appliance. Mini-plates are used as bony anchorage to move segments of teeth or to achieve skeletaldisplacement. They are usually placed and removed by an oral surgeon. Invisalign aligns your teeth with a series of removable aligners custom-made for your teeth to guarantee maximum comfort. When you change your aligners every 2 weeks, your teeth move slowly, week after week until they arrive in the desired position. The patients have to wear the aligners 23 hrs/day and they should be removed only to eat, drink and to clean the teeth. This type of treatment depends totally on patient collaboration. Not all malocclusions can be treated with this type of appliance and the duration of treatment depends on each individual problem. With the Itero intra-oral scanner there is no need to take additional impressions. Find more informations about Invisalign here. Many orthodontic “emergencies” can be relieved at home by yourself. While you await your appointment, these guidelines will help you resolve minor problems. Right after getting your braces, and sometimes after an adjustment appointment, your teeth and mouth will feel sore, causing a discomfort and even pain during the first 3 days to 7 days of treatment. This discomfort caused by the tension of the braces on your teeth is normal and temporary, it is increased with mastication. While you adjust to your new braces, you may take mild pain relievers to alleviate the pain and you should eat soft food. Sometimes new braces can be irritating to the mouth (lips, cheeks or tongue). A small amount of orthodontic wax makes an excellent buffer between the braces and lips, cheek or tongue. Simply pinch off a small piece and roll it into a ball the size of a small pea. Flatten the ball and place it completely over the area of the braces causing irritation. If possible, dry off the area first as the wax will stick better. If the wax is accidentally swallowed it’s not a problem, the wax is harmless. If the end of an orthodontic archwire has come out of the last bracket, you can attempt to put it back in place with a tweezers or a Q-tip. If the wire can’t be replaced, use wax over the area to protect the cheek and inform the office. It may happen during the treatment that the wire is getting too long behind the last bracket and is poking into your cheek. Again, use the orthodontic wax to protect the area. If the pain persists, contact the office. Please, call our office to see if the bracket needs to be re-fitted and if needed schedule a repair appointment. Try to keep the various parts that are broken or loose and bring it with you at you next appointment. In the meantime, you may cover the irritated area with wax. We hope these first aid tips are useful to you. Don’t hesitate to call the office, we are happy to help you. If an emergency that you can’t relieve yourself should occur outside of the office hours, we recommend you contact the AMDG on call dentist www.amdg.ch. When you are wearing braces or any type of orthodontic appliance in your mouth, it is important to brush your teeth 3 times/day. The ideal manual toothbrush has a concavity in the centre of the brush part for the bracket; the ideal electric toothbrush works with sonic vibrations. The surface of the teeth between the bracket and the gum is a critical area to brush correctly to avoid gingival inflammation and decalcifications. Use the interdental toothbrush daily to clean under the wire. It helps to clean the hard to reach areas and to keep the gums healthy. Flossing while wearing braces gets more difficult. For quick flossing you can use the regular waxed dental floss, which will slide between the teeth and stop at the wire. For a more intense flossing you will need a special dental floss (Superfloss). Ask our hygienists to give you a demonstration of the technique. A mouth rinse containing fluoride should be used daily before going to sleep. In patients with high risk of decay, it can be indicated to use an additional highly fluorated gel. Our hygienists can advise you. On removal of the appliance, rinse it, brush it with a toothbrush and leave it to air-dry when it is not in your mouth. Don’t hesitate to call the office, we are happy to help you.